Even before the new ivory laws came into effect, I was uncomfortable working with the material. Except in specific and rare circumstances, I exclusively used mammoth ivory for headplates. It’s important to note that folks in the violin trade are in favor of preserving the lives of the world’s remaining wild elephants. It’s equally crucial for all of us to understand that a ban on ivory is absolutely necessary. We can debate the details, such as whether items with small amounts of antique ivory should be bought, sold or transported, but when we read that approximately 100,000 elephants were slaughtered between 2010 and 2012, it’s time to realize that the ivory trade must be abandoned. If staying away from ivory, in any small way, helps reduce the global demand, musicians, dealers, and makers need to be on board. This is a nickel mounted L. Morizot cello bow belonging to a Chicago Symphony Orchestra member who wanted a safe travel bow. In this case I removed the existing ivory headplate, keeping it intact by heating it up and gently prying it loose, leaving the thin layer of original ebony beneath. Next, I glued on a thicker piece of ebony on top, trimmed the excess wood, cut the mortise, and polished. The idea is that one could remove the new ebony and re-install the original headplate should it be desired at some future date. I think the result is quite handsome. I made sure to maintain the original balance and weight of the bow of course. Like silver, this is clearly not ivory, and the bow should do just fine in the face of the new ivory laws when passing through international borders. In a world filled with websites, blogs, posts, and comments it can be surprisingly difficult to find great, informative content – especially related to the violin business. Bowmaker Sandrine Raffin of Paris has a blog crammed with fascinating history and facts on French luthiers and archetiers. Her website can be read in English, but the blog is exclusively in French, I’m afraid. If your French is rusty just copy and paste text into Google Translate. 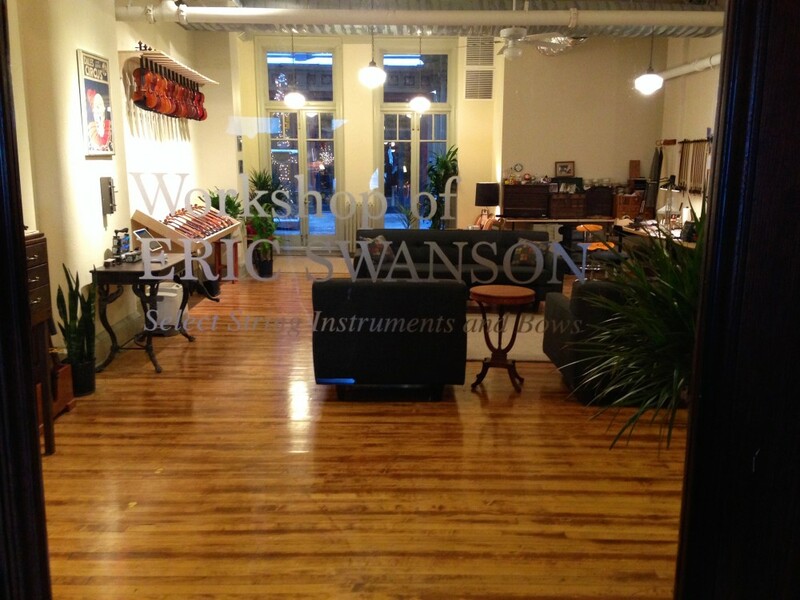 Note: This is a personal reflection on the changing nature of the violin business. I am in no way affiliated with J&A Beare or Charles Beare. London dealers J & A Beare have announced that they will begin auctioning items from their shop online starting this October. In response to what they claim is an increasing demand by customers to have their instruments and bows auctioned off rather than consigned for sale, directors Simon Morris and Steven Smith have decided to offer what they call a “small, boutique quality auction service.” Items will also be available for immediate purchase with a “buy it now” option and will come with certificates from the firm. It is important to note here that neither Charles Beare, nor his son are in in any way affiliated with J & A Beare and that we must assume that the creation any certificates issued by the firm does not involve the participation of Charles Beare. In fact, Charles Beare has recently announced that he is “now able to resume normal business.” What exactly has been going on behind the scenes is unclear – but what is crystal clear is that the noted violin expert is now independent of the firm that bares his family name. Please see the link at the end of this article to read his full announcement. Traditional auction houses like Christies and Skinners have added live online bidding to complement their in-house, in-person auctions, while Tarisio offers an exclusively online auction, which lasts for a number of days. Now J & A Beare has begun a new model – that of a violin dealer offering a kind of mini internet auction with an eBay-like format, comprised exclusively of instruments associated with the shop’s own inventory. They claim that it will “complement and enhance” their current private sales endeavors. J&A Beares has announced “Moto Perpetuo”, a kind of continuous auction system where shop inventory is constantly on offer. One can make an offer on an item or bid on it. This new hybrid violin shop/auction house model attempts to meld the highly lucrative online auction world of Tarisio and say, that of a traditional multi-generational shop like Kenneth Warren & Sons. The real goal, of course, is quite simply to make as much money as possible selling violins and bows. Will it work? If you plan on flying with your fiddle, I recommend that you print up this FAA law and keep it in your case. The law spells out that an airline should allow you to carry on your instrument without charging you any extra fee and how the instrument can be stowed in the airplane cabin.